Play tennis Reno Nevada… It’s the time of year when we bid adieu to Daylight Saving Time and hello to the night. Truly the beauty of Reno rests in the fact that at 45 degree day in full sunlight can feel incredibly warm; until the sun goes down. And as we continue to ride that wave of mild days and colder nights, it’s important to adjust our tennis gear, attire and game to accommodate the changes winter brings. Layers are the key to dressing for colder weather. Try to make sure that the fabrics closest to your skin have moisture wicking properties, unlike cotton, so when you do sweat your clothing won’t remain damp, making your core temperature even colder. Much to our mother’s chagrin, the notion that you lose 80% of your body heat when you don’t wear a hat is actually a misnomer. In reality the head is only about 10% of our body’s surface area. In order to lose that amount of body heat mom warned us about, we would have to lose almost 40 times as much heat per square inch as any other part of our body. Our head loses heat because when we’re outside, we have clothes on, and in the absence of hat, heat is lost. That being said, wear a hat, and keep the heat in, not out. While gloves can be tricky in the colder weather there are a lot of great options on the market to make winter playing easier. Thin “running gloves,” or fingerless gloves can provide both warmth and feel when holding the racquet. I know players who use the “hot hands” warmers on the backs of their hands to allow them to grip the racquet and still stay warm. Don’t let the cooler temperatures trick you into thinking you don’t have to take care of all aspects of your wellbeing. Staying hydrated is still paramount even though you may not feel as thirsty as you would in the middle of the summer. With the sun lower in the sky, sunglasses can make finding that high ball a little easier, and can reduce the glare we sometimes get in the winter. Sunscreen should be applied before you get dressed. All too often I have made the mistake of only putting sunscreen on my hands or face, only to warm up quicker than anticipated on the court, and realize I missed my arms and legs. While we should be warming up, and stretching, year round prior to playing, somehow in the summer when we’re already warm, the ritual seems redundant. Very often the simple act of bending over to tie our shoe, or take our racquet out of our bag, seems like an equally effective warm up as actually stretching. However, in the cooler weather it is imperative that not only are we spending some time static stretching, but that we are including a dynamic warm up. Incorporating more movement will allow your muscles to warm, in addition to gauging exactly how the colder weather is affecting the ball and your ability to move to your shots. Finally, you will need to adjust your game. In colder weather, the ball doesn’t bounce nearly as high or as deep in the court. You will need to exaggerate your topspin on your groundstrokes through earlier preparation and really dropping the racquet head in order to get under the ball even more. If you haven’t worked on slice and/or drop shots, now is the time. The combination of colder temperatures, combined with the tennis balls themselves being colder, means the ball will remain low. Using slice, you can make a low ball even lower and much harder for your opponent to retrieve. Much like your groundstroke, you’re going to find your top spin serve not kicking up as high as you’re accustomed to. Working with the cold, you can make better use of your flat and slice serves in keeping the ball down and your opponent guessing. There is a certain reunion that cold weather brings to tennis – the serve and volley. Knowing that the modern game of grinding out groundstrokes, will be hampered by colder weather, it’s imperative that you get to net. Your opponent’s shots will be traveling slower and lower. No sense wasting your energies retrieving short, low slice shots, make your move to the net to take advantage of the changes cold weather provides. 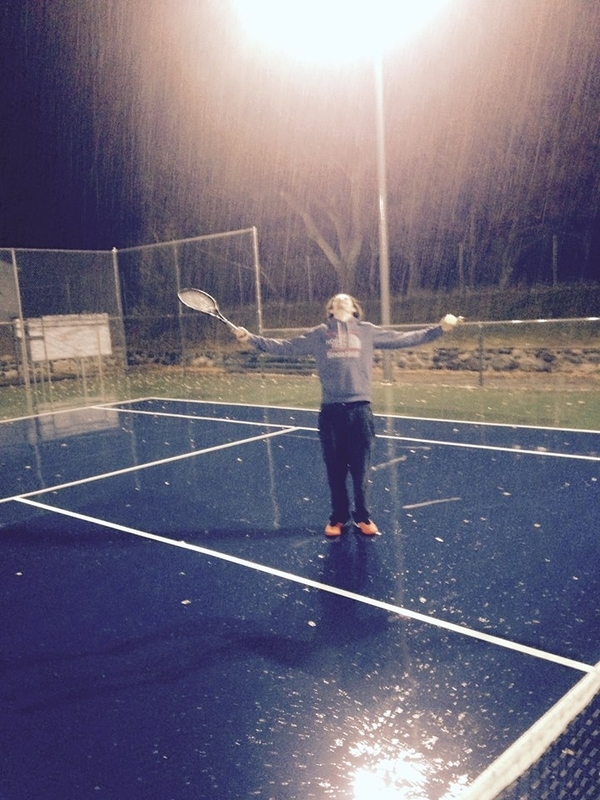 Colder weather shouldn’t be a deterrent to enjoying tennis. It’s a great time to add new strokes and strategies to your current game. Continuing to play tennis in the winter allows you to remain outdoors in the Reno sun, exercising, while simultaneously playing a sport you love. Without the 90-degree temperature and humidity, you may be able to play longer and stay in the longer rallies without feeling like you are going to pass out. However, it’s important to keep in mind that the cold weather does have an impact on your play–and the ball. The colder the weather, the less bounce the ball will have. Meanwhile, other shots, like your topspin, won’t be as effective. If you have a big kick or topspin serve beware: the cold weather will take some of the kick/bounce out of the ball. Flat serves and slice serves will be more effective for you in the cold and force your opponent to have to get down low for a ton of balls. This also means that the ball will bounce low for you too. Bring your racquet back early for good preparation to adjust to the low bounce, and start your backswing lower than you typically would. If you have a topspin approach shot and a slice approach shot, you may want to try to lean more towards some slice approaches on any ball that does not bounce much higher than the net. This keeps the ball extra low and really forces your opponent to get under the ball and hit a passing shot, which is tough. You also need to move to the ball more than you would in warmer weather. Since the ball is flatter it will not get as deep in the court as it would if it was warm out. Be sure to move well into the court for shorter balls. With the ball being a little flatter, be sure to aim deeper and hit harder to keep the ball from landing too short and allowing your opponent to step into the court to hit every ball.